7 One-and-Done Resolutions to Start the New Year! Forget resolving to make lifestyle changes that you’ll abandon by February. We’ve got New Year’s resolutions for your home that you can achieve in one step. Resolution #1: Use less energy. One-step solution: Install a programmable thermostat. The bulk of your energy costs will be spent heating and cooling your home. Put a dent in that bill with a thermostat that’ll keep your house comfortable when you’re home to enjoy it, and saves energy when you’re not. You’ll spend less than $100 for a basic model, and can save as much as $180 per year. One-step solution: Get a rain barrel. Irrigate your lawn for free with a rain barrel, which can save 1,300 gallons of water and lower your water bill by about $35 per month in the summer. You’ll spend $35 to $200 on a commercial barrel, or you can save more money by making one yourself from castoff food-grade containers. A 55-gallon syrup drum is about $10. 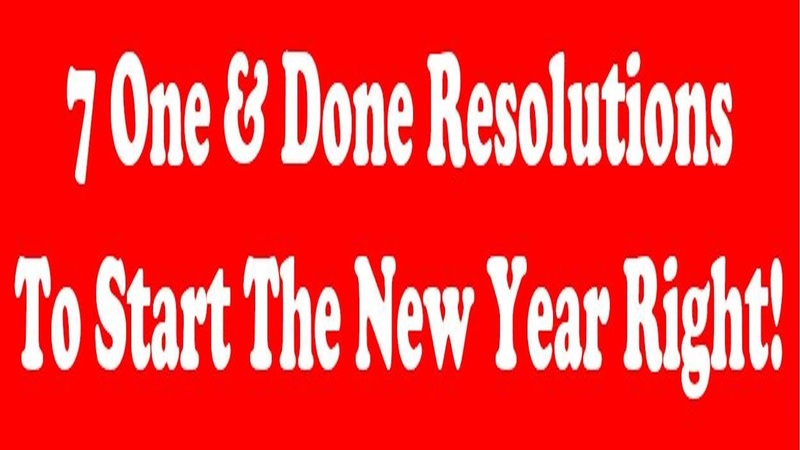 Resolution #3: Decrease your chances of a home fire. One-step solution: Schedule a chimney inspection. Creosote, birds’ nests, and other debris can clog your chimney, causing a home fire risk, but an inspection will sweep those problems away. A level-one inspection, in which the inspector will look for damage and remove obstructions, will cost anywhere from $79 to $200. Resolution #4: Beef up your home security. One-step solution: Install outdoor motion sensor lights. These lights, which plug into ordinary wall outlets, provide a security boost by illuminating your home’s exterior when anything moves outside. They take minutes to install and cost anywhere from $13 to $105. Resolution #5: Make the most of your storage space. One-step solution: Pitch everything you haven’t used in a year. The first step in gaining storage space is decluttering. We’ve got ideas for how to responsibly get rid of hazardous materials, old technology, kids’ stuff, books, and more. Bonus: It won’t cost you a penny. Resolution #6: Save money on your insurance premiums. One-step solution: Assess your homeowners policy. First determine what kind of coverage you have now, then assess how much you really need. If you’re able to raise your deductible, you’ll pay a lower premium per month. Resolution #7: Prepare your family in case of a disaster. One-step solution: Make an evacuation and communication plan. If disaster strikes, you’ll be ready: Document your escape routes, designate a meeting place in case family members are scattered, and assign a “communication commander” who will relay messages between loved ones. Don’t forget to include your pets! What are your New Year’s resolutions for your home?